All good health starts with the digestive system — with the proper metabolism of food. Food is just as powerful as medicine, and when consumed in the right proportion will keep all disease at bay. 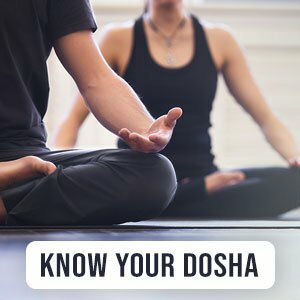 According to Ayurveda, individuals are made up of a unique combination of three body-mind energies known as the doshas: Vata (Ether/Air), Pitta (Fire) and Kapha (Earth). You can determine which dosha is predominant in your body by taking our quiz. This constitution is called prakriti, and it governs one’s physical, mental, and spiritual health. Preventive care is paramount, which is done by balancing one’s doshas with a healthy diet. While there is no one-size-fits-all approach, an important principle in Ayurveda is to make sure your food is always fresh and seasonal. Agni means ‘fire’. In the case of food, agni translates into digestive fire. If your agni is strong, your body can digest all food, and keep you healthy. A weakened agni will lead to an imbalance in your doshas, which in turn will cause your body to produce toxins. Let’s look at the seasonal wheel of the year. During summer or in hot climates, it’s advised to eat a Pitta-pacifying diet. A diet that calms Vata should be consumed during the transitional times of spring and autumn. Kapha is aggravated during the cool and damp of winter, and hence we should eat a Kapha-calming diet at this time. For example, cold and damp frozen desserts should be avoided in winter. Likewise, we also have the cycles of the day. Between 2 a.m. to 6 a.m. is the Vata part of the day, which means it’s time for yoga and very little food; from 6 a.m. to 10 a.m. is the time of Kapha, where a moderate breakfast with warming foods will boost metabolism. The Pitta part of the day is between 10 a.m. and 2 a.m., when our digestive agni burns brightest and it is the time of the day we can eat our biggest meal. Then, between 2 p.m. to 6 p.m. Vata people may desire a snack while Pittas and Kaphas should eat less often. Dinner time, from 6 p.m. to 10 p.m., is a Kapha time and one must eat very little because the digestive agni is at its lowest. A light supper at this time is best. If you would like to know how to eat right for your dosha, read our article here. Sweet (Water + Earth): Sugar, honey, rice, pasta, milk, etc. Sour (Water + Fire): Lemon, hard cheese, yogurt, vinegar, etc. Astringent (Air + Earth): Beans, lentils, pomegranate, etc. Bitter (Air + Ether): Leafy greens, turmeric, etc. An Ayurvedic diet is completely personalized, and depends on the doshic makeup of each individual. To know more about what food is best for you, determine your dosha to know your body’s internal makeup. Then, you can proceed to personalized diet plans for your dosha.